Let’s admit that most owners are in a worse shape than their dogs, even if they spend most of the day together. Though most dogs can easily finish the 6 kilometer ’Base’ run, the same cannot be said about their two-legged companions. Such a distance on a flat surface can be a serious ordeal, if we are not prepared for it. Without exaggerating we can say that who doesn’t regularly run, can only run a maximum of 2 kilometers without feeling tired. 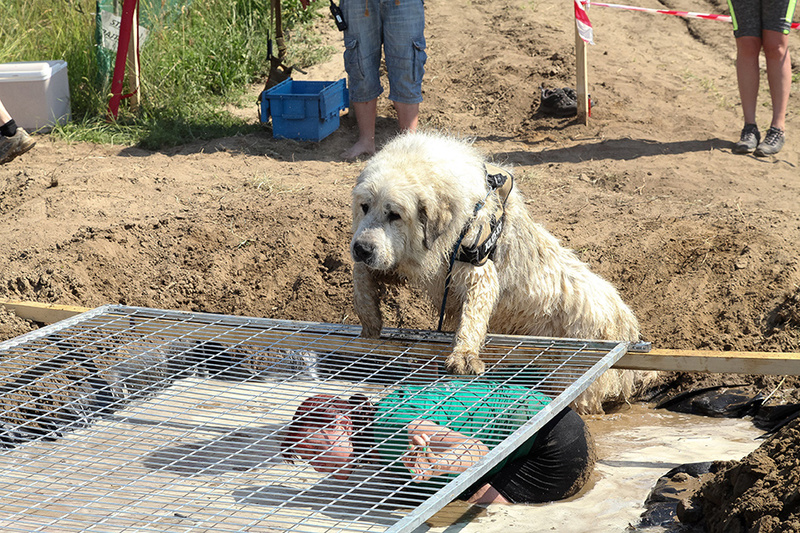 The Hard Dog Race focuses more on the off-road track and the obstacles rather than on the distance. To finish the race, it is important to be able to run at least 10 kilometers on a flat surface without stopping, and it would not be amiss to train off-road as well. Running in the mud is a tiring activity, so do not miss out on that during training. Run uphill, jump over fallen trees, squat, do pushups, and do all of this at the same pace. Every beginning is difficult, but we can quickly prepare for shorter distances. It is advisable to start with easy-to-accomplish sections and define intervals (e.g. 400 meters running, 400 meters walking alternately) and increase the distance by a half or one kilometer a week, considering our fitness and performance. It is better not to watch our time results, until we are able to run without any inconvenience beyond the set time. Numerous smartphone applications can be downloaded to measure the distance and time. These are great tools for our preparation. For the first few training sessions we should leave our dog at home. It is better for both dog and owner, to avoid slow-paced beginnings. The dog’s physical fitness is not the most important part of their training. When it comes to distance and terrain, HDR is not a big challenge for active dogs. There is much more to the race. Our four-legged-friends have to run beside other dogs, tackle obstacles sometimes close to each other or in an excited mood, while they are (ideally) under constant control, and keep their focus on us. They have to cooperate with their owner in a concerted manner. They need to be able to handle unknown situations without any signs of aggression or fear. This is a much bigger challenge, rather than a few weeks’ preparation, and it requires the work of a lifetime. Well-socialized dogs can smoothly compete the race. To achieve this, the first step is to take them to new places, to make them face new situations, strange noises, to get them acquainted with some of the breeds they have never met before, to walk with them in the city, in crowd, to take them into shopping malls, cafes or to use public transportation with them. Not to mention obedience training. 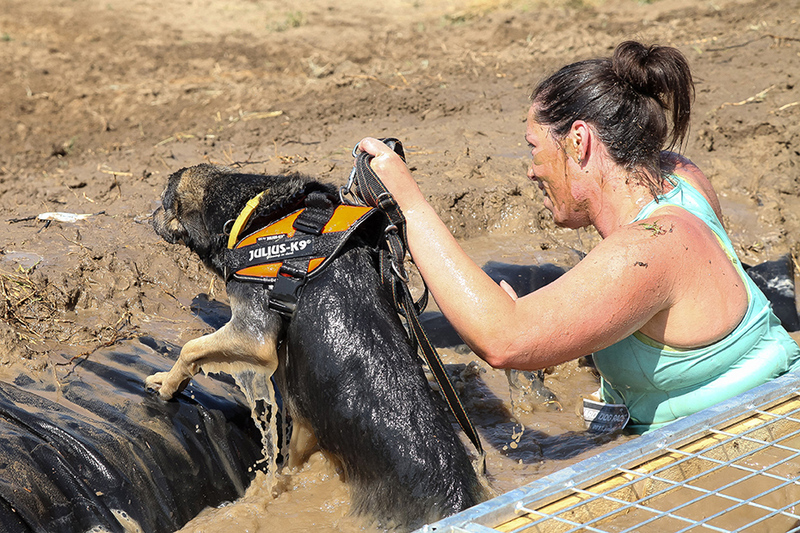 If we feel that during our running exercise we are also able to watch our dog, they can join us in a special pulling harness, attached to the jogging belt, or in their Julius-K9® dog harnesses, which are worn by most of the dogs during the contests. During our trainings the dogs can follow us, but please note, they have to be on leash to participate in the race. So they need to get used to it. During the trainings we can use minor terrain features or natural obstacles in front of us. It is important to prepare our dog to get into water and mud, which we can do through positive reinforcement. Never force anything on them that makes dogs afraid. Look for another way to make them comfortable with what they have to do. Also get a pair of comfortable terrain running shoes, which you are able to devote for this sole purpose. After finishing the race, our pride cannot be covered by the mud on our shoes. We can also find so called „kennels” on Facebook. Find the closest one to you and join them for a training session!